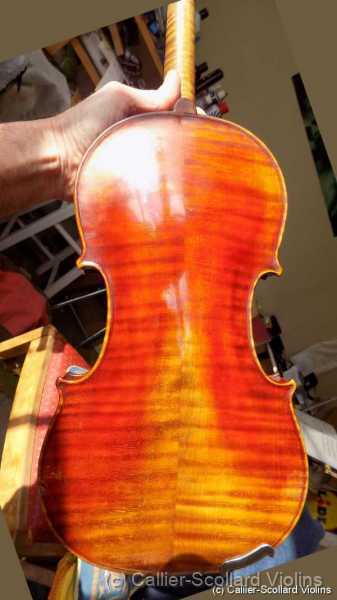 Here are some photos of a 1925 FJ Callier violin. Perhaps it was made from the wood of old St.Mary's Church as is the one he made in 1923 mentioned in a San Antonio newspaper. Thank God for the great crafstmen and women of the world. interested to read it, where did you find a copy? 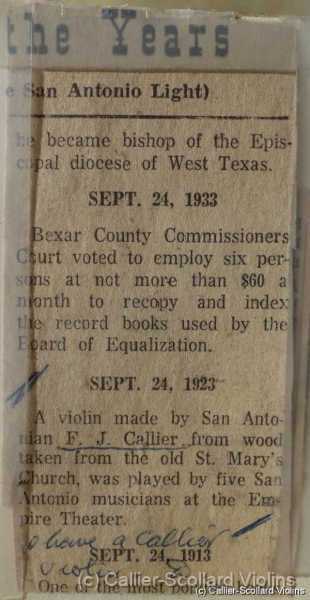 Here are a few photos of my Callier violin with that wee paragraph from a San Antonio newspaper regarding a 1923 fiddle of Frank's. I just love the colour of his amazing varnish. A year ago I took this instrument to a luthier here as I needed the pegs adjusted. This fellow handles many a top class violin for the London orchestra squad (I am just a humble fiddler don't you know) but when he was finished and handing it back to me, he actually smiled and said, "very nice violin." Magic! Best of luck in all your own musical endeavors. It's fantastic that you are carrying on such a great tradition of the original shop. Well done! The photos look great-- and the newspaper article came out very readable. Many thanks for that. Frank lives on in his instruments and in the happiness they give.